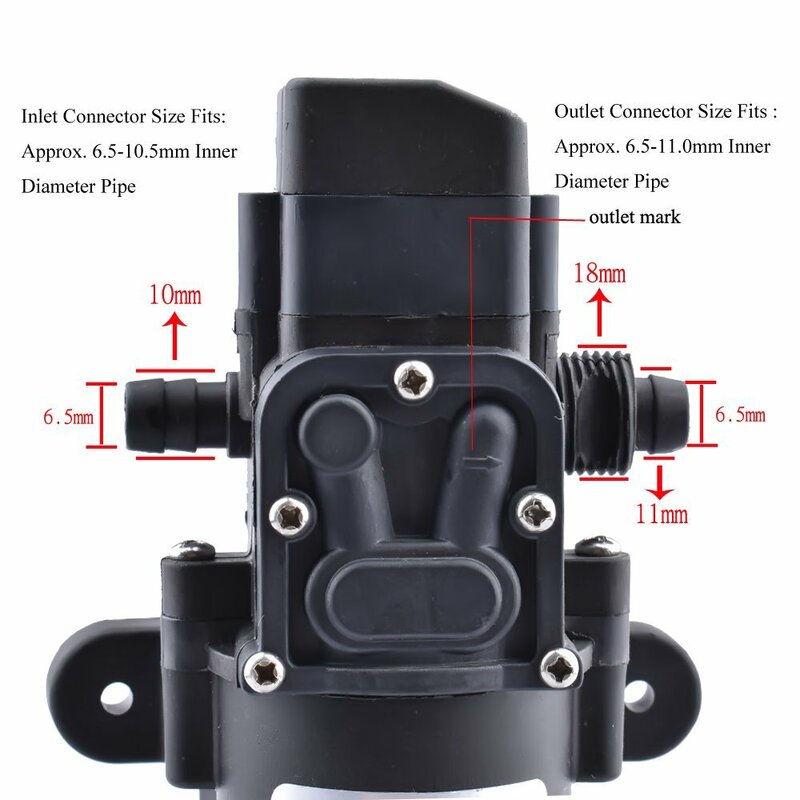 High quality DC micro diaphragm pump, widely used in general industry equipment, medical equipment, chemical equipment, farming (lawn and garden), tour vehicles, special vehicle, ship, beverage, vehicle cleaning, carpet cleaning, ground cleaning, water purification and water treatment equipment. Rubber bracket can absorb vibration from the pump when working. Connector size: Inlet connector size fits approx. 6.5-10.5mm inner diameter pipe, Outlet connector size fits approx. 6.5-11.0mm inner diameter pipe. Agricultural purposes: spray for farm chemical, pesticide. This is a product with a pressure switch. It will be automatically cut off the power supply and the motor stops running when the water outlet is turned off. Once the water outlet is turned on, the motor starts running again. This type of product can be applied to occasions, which have demand for energy conservation and frequent switching, such as machine washing, feeding water to a solar energy system, and remote automatic controlling system of conveying water and suspending water supply, etc. Note: Pump should be used in dry condition, cannot submerge into water.